Energy efficient homes that generate their own sources of electricity are cited by various sources as being an effective way to reduce greenhouse gas emissions in growing cities. At the same time these structures are also being researched for their ability to improve the resilience of populations and assets to increases in extreme weather conditions brought on by climate change. 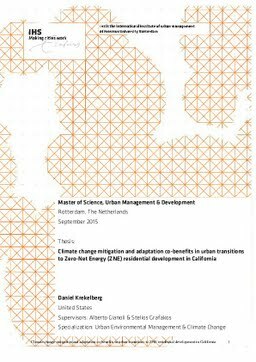 Urban climate change planning has recently shifted in the direction of implementing single actions that support both mitigation and adaptation. The purpose of this research is to evaluate the potential of an emerging building typology, Zero-Net Energy (ZNE), to fulfill the dual promises of mitigation and adaptation at multiple levels of governance. In California, sustainability transitions in the building and energy sectors have been gaining momentum in recent years, benefitting from progressive policies and technological advancements enabling distributed renewables and improved building design. ZNE currently represents a small but growing portion of this trend and policymakers envision a future where this becomes the default standard for new and retrofitted homes. But further interventions will be needed to move ZNE from niche to mainstream action, including the support of emerging technologies that connect renewables into the existing grid infrastructure. Although reconfiguring established models and fostering multi-stakeholder collaboration may prove to be a difficult task, this research indicates that myriad benefits may await those actors willing to take on the challenge. Thesis Advisor Gianoli, A., Grafakos, S.